It's the beginning of a new month and I thought maybe I should try a no-buy June. HA! Who am I kidding, no-buy?? Truly, the thought crossed my mind. I decided I would give my brain some credit for the idea and commit to a 'low-buy' June. My credit card will thank me for it. My resolve to reduce my spending on polish was broken within mere hours of making the decision. My excuse this time? Free shipping from Petal Polish, and a new collection featuring a gorgeous yellow that I *had* to have. What can I say, I'm weak. This will be a little more pic-heavy than my normal posts - all three I purchased were so beautiful I'm breaking from my usual one picture laziness! I have one polish from the new Aspley Collection, and two more from the previous range. Hibiscus, from The Aspley Collection, is a stunning fiery golden yellow with a beautiful iridescent orange shimmer. This was the polish I had to have. Any nail polish fanatic knows how difficult it is to find a yellow that reaches opacity without a white base - so how does Hibiscus fare? I was excited to find that after two thin coats I had only a few minor patches and knew a third would make it rock solid. Ding-ding-ding we have a winner! My photos show three coats with one coat of Pretty Serious Crystal Coat. This is an absolute must-have yellow for me. Iris hits me right in my weak spot. 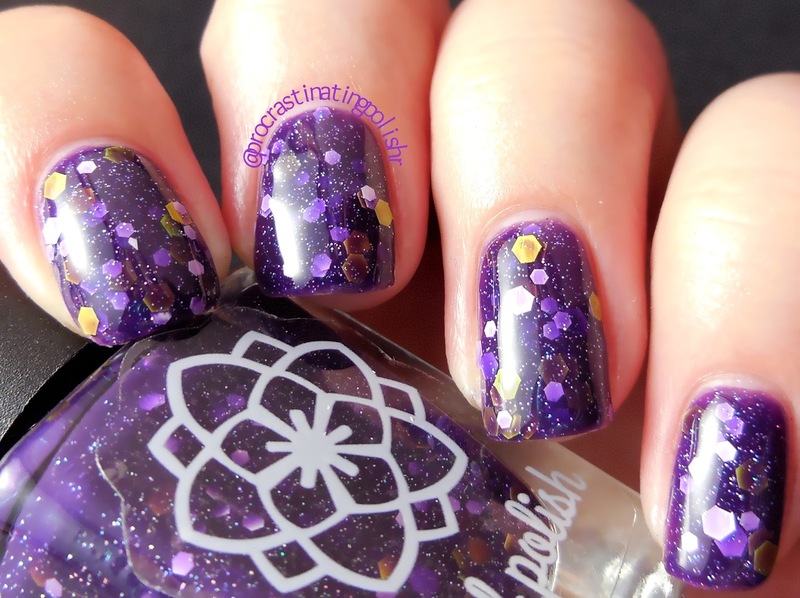 I swooned over the royal purple jelly in the bottle and on the nail it is rich and wonderful. My eyes just wanted to caress its beauty for the rest of time. The white and yellow hexes are abundant, paired with a dash of holographic shine. Due to the generous amounts of glitter this requires a little extra care with application but it's totally worth it. A little dabbing, a little poke here and there and voila, perfection. 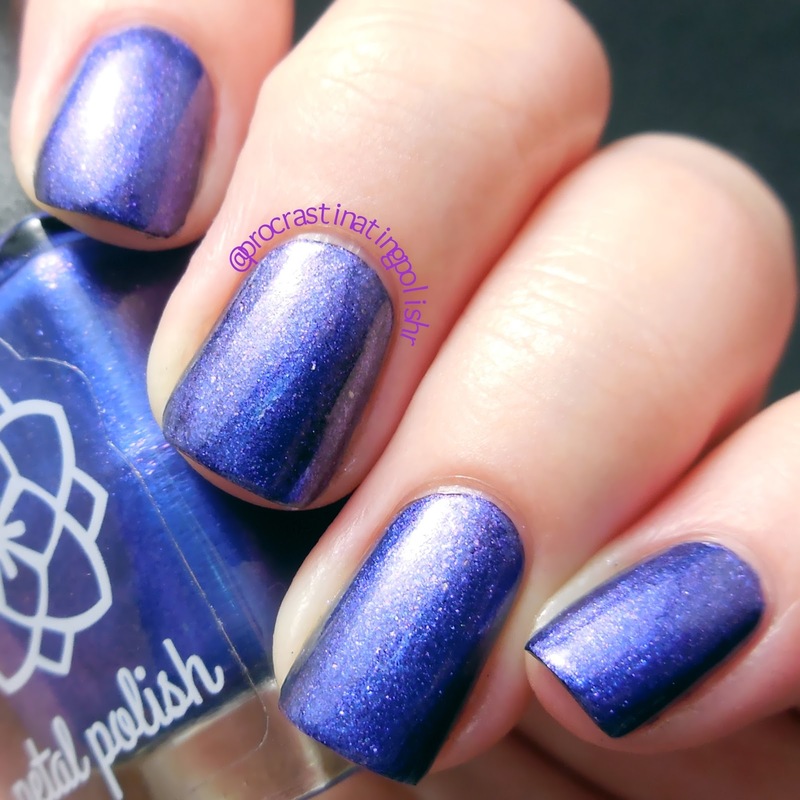 Iris is a thirsty little petal, so I used one coat of Essence Gel Look Top Coat and one of Dead Set Babes Super Glossy! 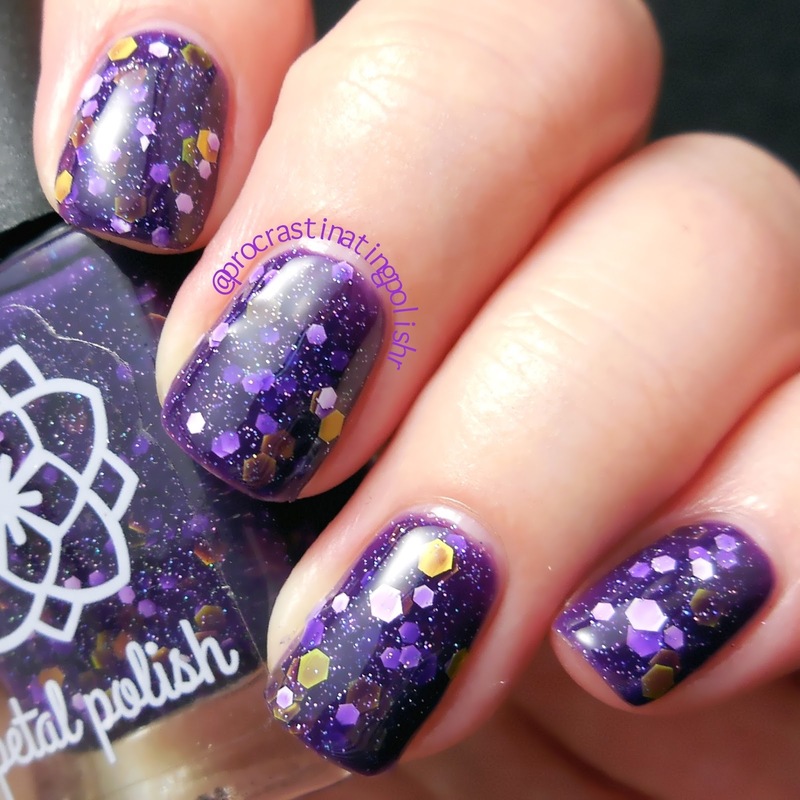 Glitter Topcoat for that smooth glassy finish that may induce involuntary moans of ecstasy upon viewing. Periwinkle is a favourite colour of mine so this one jumped in my cart without a second thought. I found this polish to be a little sheer, though the tiny violet flakes do a lot to distract from that. The colour itself is impossible to capture because it's impossible to accurately identify. More chameleon than multichrome, it's about 7 different shades of blue and purple depending on the light and angle. I saw some definite potential to double down on the pretty with some black undies. Bam! No longer periwinkle, it takes on rich sapphire hues over black undies. It positively comes to life with the violet flakes shimmering like nobodies business. Tilt your hand a few degrees and the flakies disguise any trace of blue and turn the whole nail a rich violet. Though I wasn't sold on Periwinkle at first, I'm falling more and more in love with how versatile the colour is. Worn alone it's understated and feminine, then with a black base it reveals a hidden identity and amps up the vamp. For my swatches I wore three coats alone, then two coats over black. Both times topped with Pretty Serious Crystal Coat. Not only am I seriously impressed with the polishes shown here, I'm astounded by the service! I placed my order on a Monday night, and came home Tuesday to find the parcel had been hand delivered to my front door. Now I don't believe this is a regular service Christine offers (I'm sure flights around the country are just a scratch more expensive than postage) but I'm sure it's at least an indication that all these polishes are made with a lot of love and care. 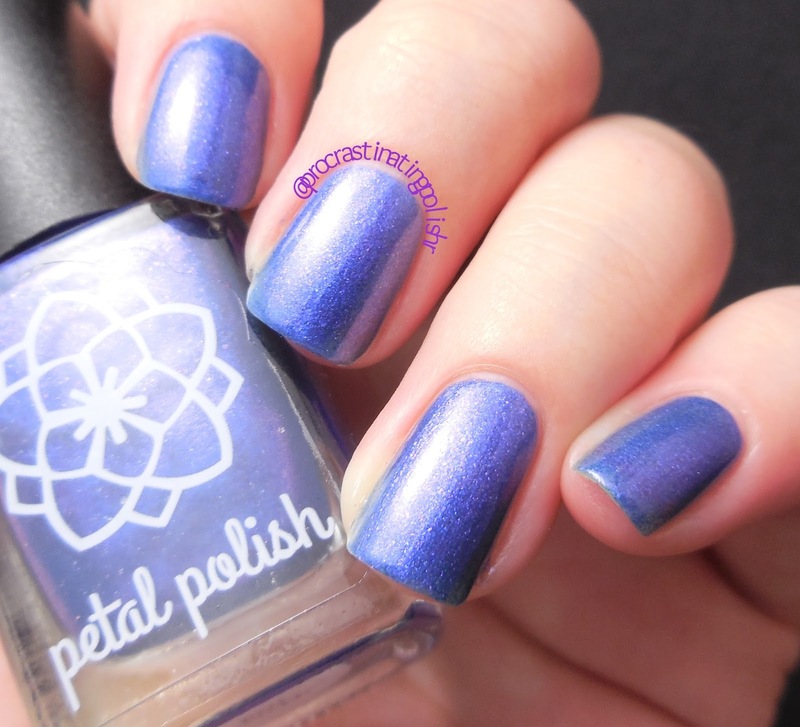 Have you checked out Petal Polish on Etsy yet? Do it, the link is right there!